Do Work That Actually Brings In Money! If you could only do one task on your business today, what would you do? 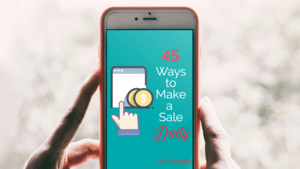 Make sure it's one of these 45 moneymaker tasks. Or use this list as inspiration to come up with your own daily moneymaker activities. By clicking on the orange button above, you're giving Lexi Rodrigo permission to send you email about 3 times a week (sometimes less, sometimes more). You can unsubscribe any time.